I am a member of a Yahoo Group called AncestralQuest. It is a discussion group for people who use the Ancestral Quest program. You can find this group by starting Ancestral Quest, clicking on the Internet tab and selecting Ancestral Quest Home Page. From there, click on Community and select AQ User Groups. Recently, one of the group members was discussing a census record. On this record was information about a man, his wife, and their family. There was evidence from other records that they were married in 1884. There was also evidence that the woman had only six children. 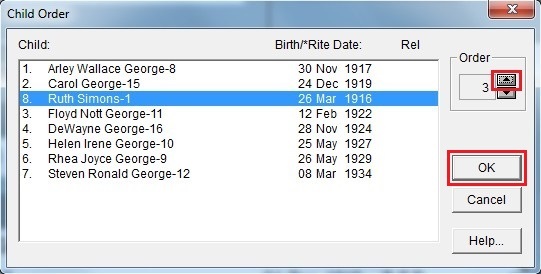 The problem was that the census record showed a seventh child with the husband’s surname, and listed as a son, but he was born in 1880. The assumption was made that this was the son of the father in a previous marriage, and that the wife in the first marriage was unknown. 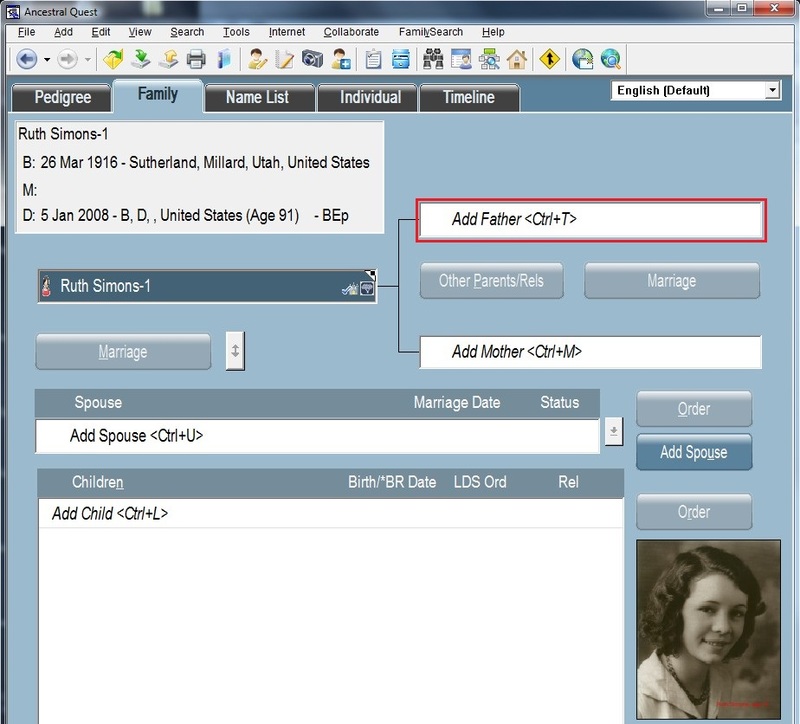 1) Ancestral Quest will not allow you to create an UNKNOWN spouse the way PAF will. 2) There is no way to properly show the relationships of children to parents in more than one parental family. 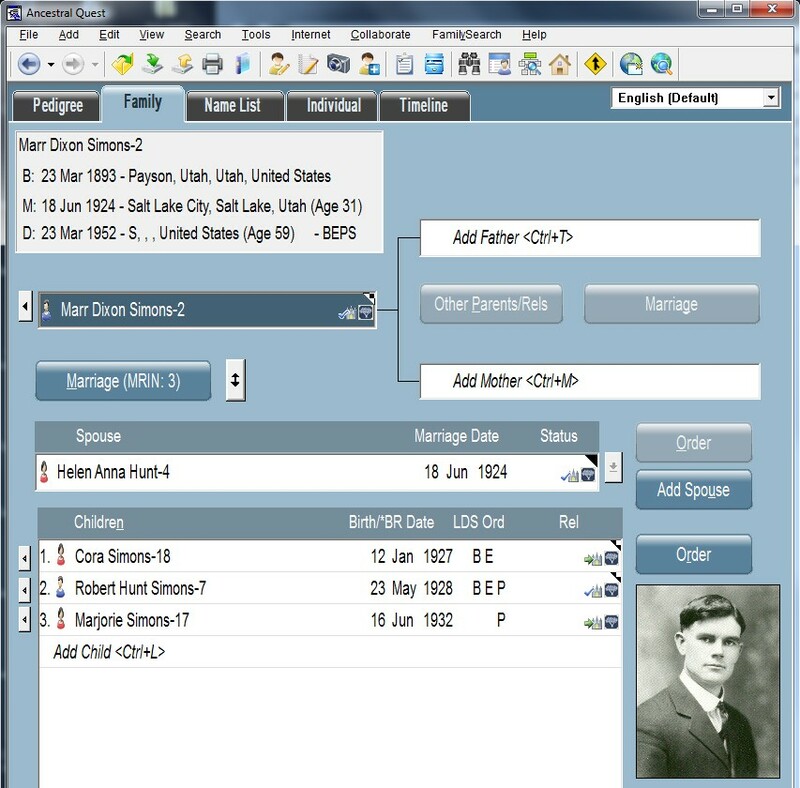 I have taken records from my own family file where these relationships also exist, and I will show how to create these families in Ancestral Quest. I will also show why you should convert your PAF files to the AQ file format. 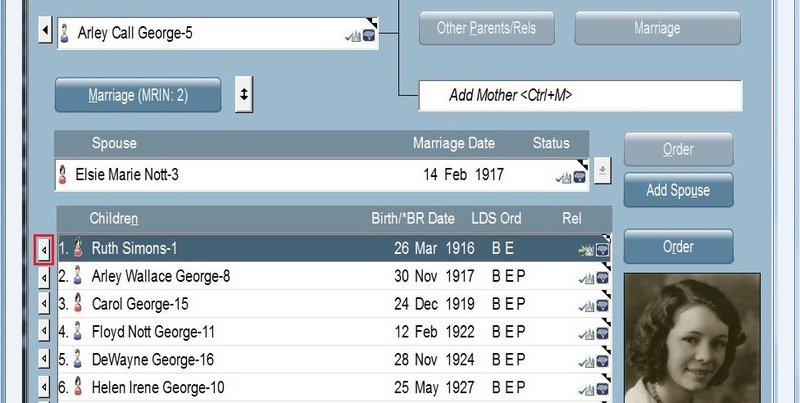 The unknown person in this case is the assumed first wife, who is the mother of the child born in 1880. It is easy to get into the habit of always doing things the same way. We create a marriage, then we add the children. 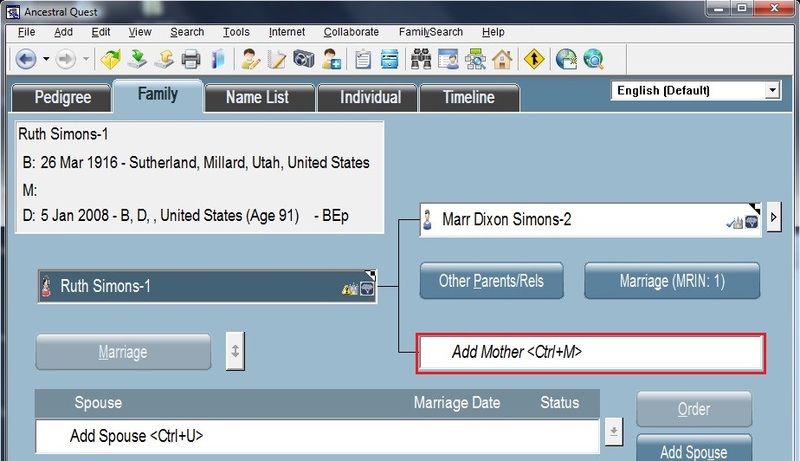 To create a second marriage for one of the spouses, we highlight that person and we either click on Add Spouse, or we press <CTRL> U. Both of these processes open the Add Spouse for… screen. 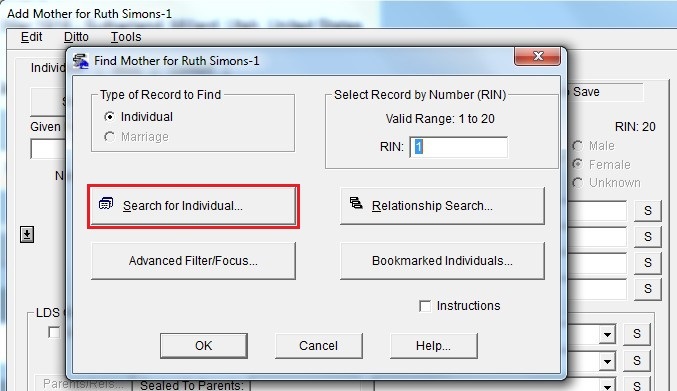 Here we have the option to create a record or click on Search for Existing Spouse…. Neither of these options allows us to create a marriage with only one spouse. 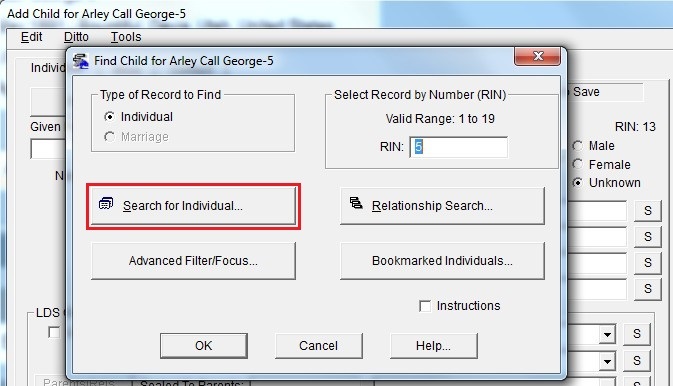 The proper way to do this is to first find or create a record for the ‘seventh’ child. Next we need to create the family and attach the child to the only parent in that family. 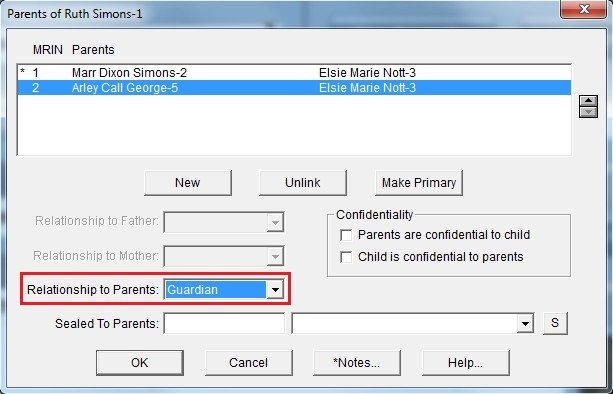 In Family view, with that child as the primary person, click on Add Father or Add Mother, depending on which one is documented. 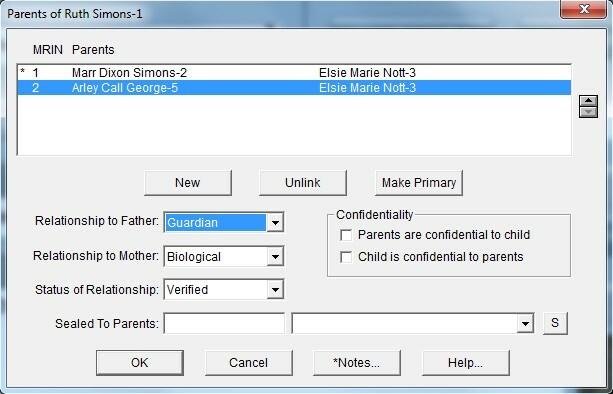 In my file I have a father, Marr Dixon Simons, and a mother, Helen Anna Hunt. Helen Anna Hunt had only three children. Marr and Helen were married 18 Jun 1924. I also have a child, Ruth Simons, a daughter of Marr Dixon Simons. She was born 26 Mar 1916. For now let’s assume that she is the daughter of an unknown mother in a previous marriage. With her record highlighted, click on the Add Father text. Her father is Marr Dixon Simons, and his record is already in my file, so I click on the Search for existing Father… button. This brings up the Find Father for… screen, where I click on the Search for Individual… button. This brings up the Search for Father for… screen. Here I highlight the name of Simons, Marr Dixon, and click on the OK button. 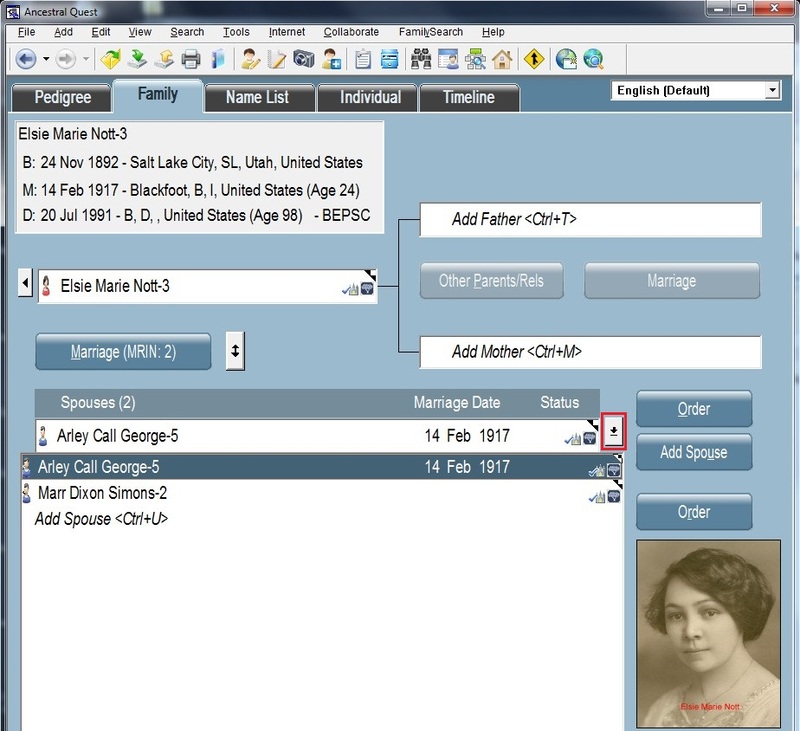 This brings up the Add Father for… screen where we select Add Marriage. This will place Ruth into a family with Marr as the father, but no wife, yet. Click on the OK button. We now show Ruth as the daughter of Marr Dixon Simons, with no mother. I’ll click the arrow button next to the name of Marr D Simons to move him to the primary position. Here I open the pull down window to show all of the spouses of Marr Dixon Simons. 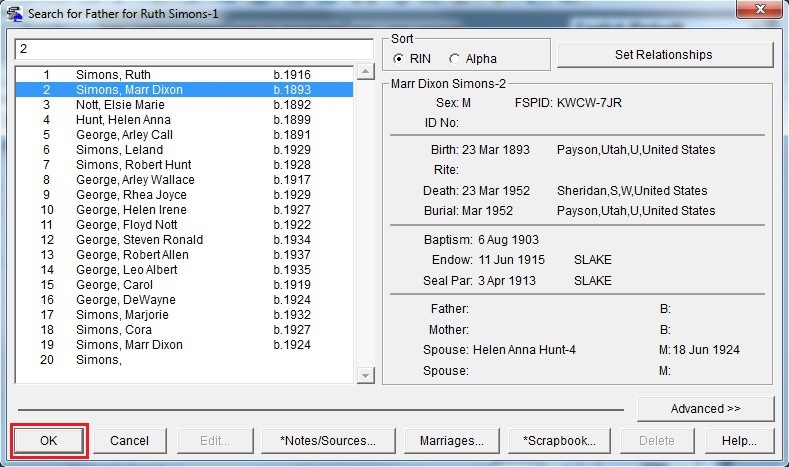 This shows that Marr Dixon Simons has two marriages. One is with Helen Anna Hunt, and the other is with UNKNOWN. There is no RIN associated with the UNKNOWN wife, and she doesn’t have an Individual record. In reality, Ruth Simons is the daughter of Marr Dixon Simons in a previous marriage. That marriage was with Elsie Marie Nott. She is also in my file, so I will create the relationships in Ancestral Quest, to reflect reality. 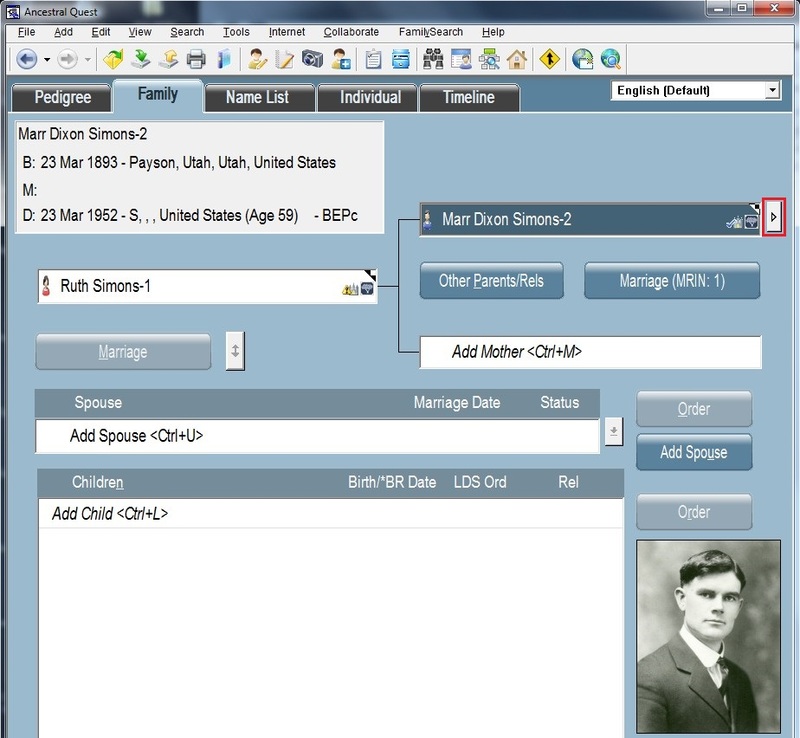 I want to change from an UNKNOWN mother to Elsie Marie Nott in this marriage, so I click on the Add Mother text. This brings up the Add Mother for… screen. 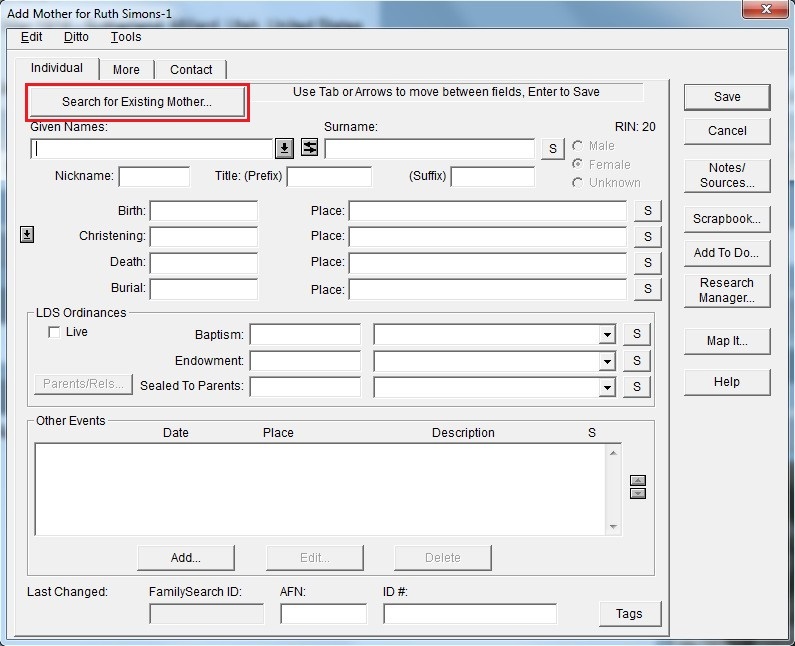 Here I could create the record for Ruth’s mother, but she is already in my file, so I click on the Search for Existing Mother… button. Here I want to find Elsie, so I click on the Search for Individual… button. I highlight her name, and click the OK button. 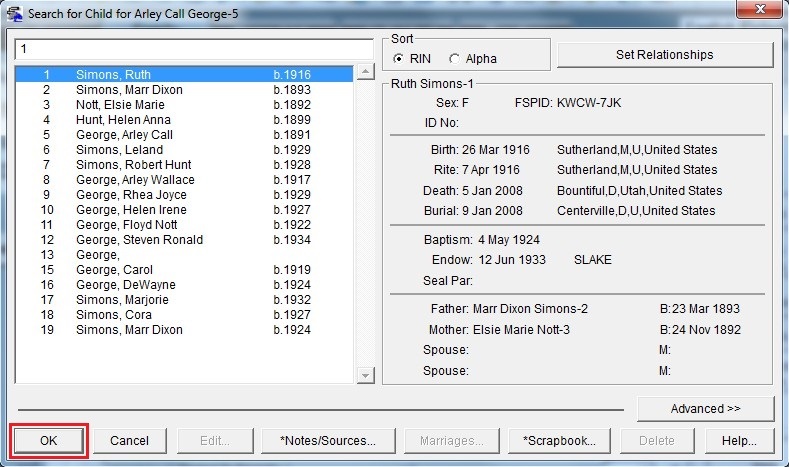 Ruth is now shown as the daughter of Marr Dixon Simons and Elsie Marie Nott. 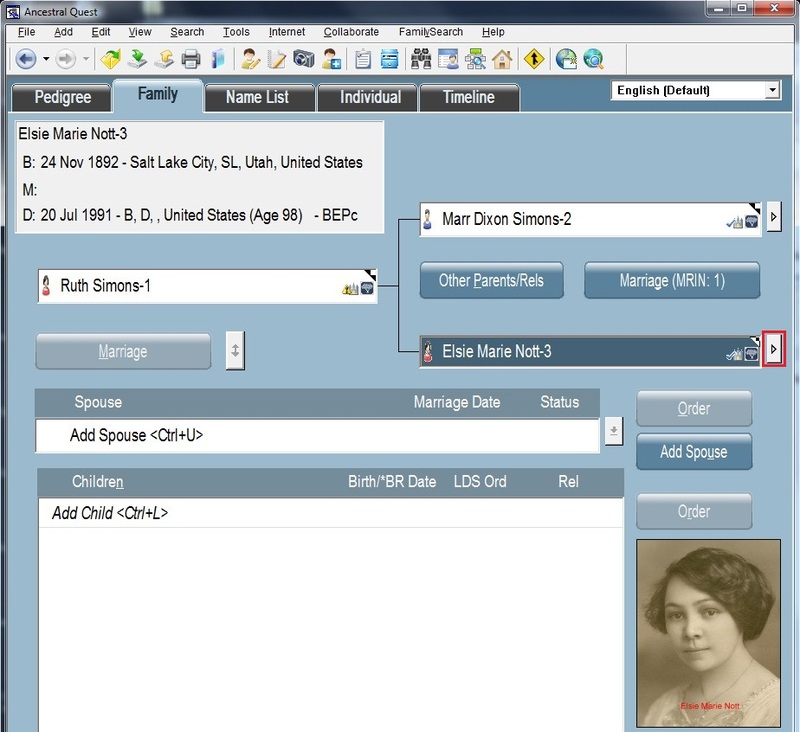 I want to see any other marriages for Elsie, so I click the arrow next to her name to move her to the primary position. Here I see that after her divorce from Marr, Elsie married Arley Call George. Here I want to switch to a PAF file format, to show the advantages of the AQ file format. I will move Ruth to the primary position to show her relationship to her parents. I will click on the Other Parents/Rels button. This shows that Ruth is the biological daughter of Marr and Elsie. What it does not show is that she was not raised by her biological father. Her mother remarried, and she was raised by Arley Call George and Elsie Marie Nott. Let’s add Ruth to that family. We want to add Ruth to this family, so we click on the Add Child text. Her record is already in the file, so we don’t want to create a new record for her. We click on the Search for Existing Child… button. We highlight her name, and click the OK button. Now she is in the family, but she is the oldest, not the youngest child, so we click on the bottom Order button. The Order button above it is used to place marriages in order. I highlighted her name and started clicking the upward pointing triangle. Just two more clicks, and she will be the first child in the list. Then we will click the OK button. Now that she is the first child, we will click the arrow button next to her name to make her the primary person. Here we will examine her relationship to her new family. Lets examine this same relationship when it is stored in the AQ file format. The AQ file format has the ability to store information which will not fit into the older, smaller, PAF file format. 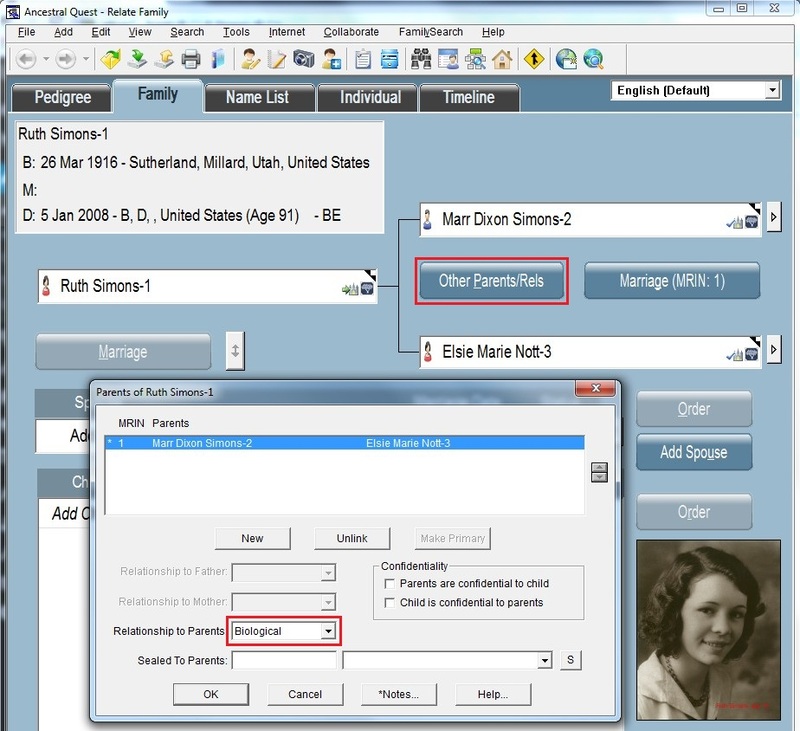 Both formats can be opened, read, written and saved by the Ancestral Quest program, but the AQ format gives users added capability, without losing anything except the ability to use the older, slower, less capable PAF program to open it. Conversion is simple. Click on the File tab of the Menu bar and select Database Converter. 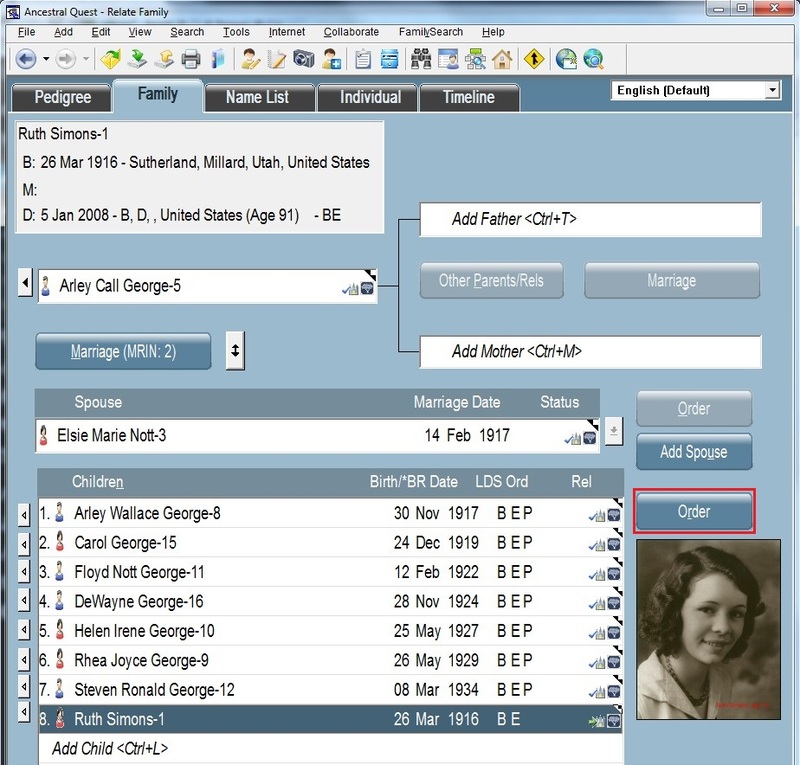 In a few seconds Ancestral Quest will create a new file containing all the information in the old PAF file, and with the ability to store information which could not be stored in the old format. Give it a try. Work with the AQ file format for one week. The older, smaller, less capable PAF file is still in your folder where you left it, just in case you choose to go back. I have never looked back since I changed. You probably won’t either. Thank you for a very detailed explanation of how to deal with the problem of Relationships. I have a similar problem with a lady who married and had a child, the husband died/disappeared and 3 years later she had an illegitimate child. A further 8 years later she had another illegitimate child. Six years after that she married and had 3 children. With the help of a friend we found how to add the Unknown ‘spouses’ using the same method that you described. However, as usual, I did a Database Check before closing the program and the report showed 2 errors which I believe are associated with those Unknown ‘spouses’. Marriage (10449) has no GUID (Global Unique Identifier). Should I try a Database Repair or leave those 2 errors? Obviously I do not believe that this lady is unique and there is every chance that this problem will surface with others in my database. Incidentally I am using AncestralQuest for Mac. I will be very grateful for your advice. It is likely that the problem being reported is related to the marriages with an unknown spouse. I would not be too concerned. Let me explain why. 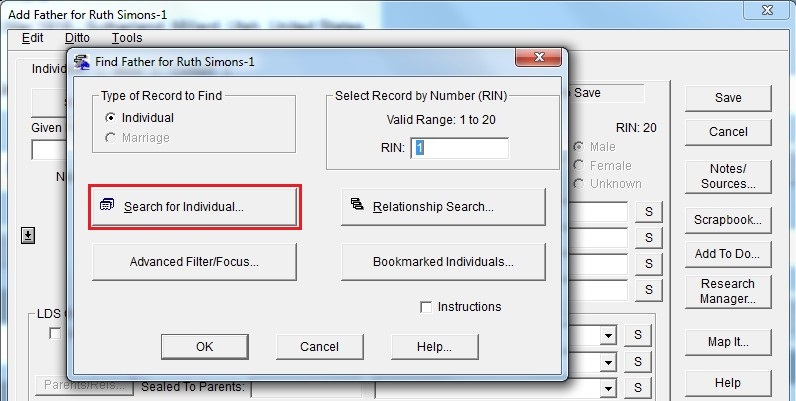 The GUID is created to identify a specific record as it is created. 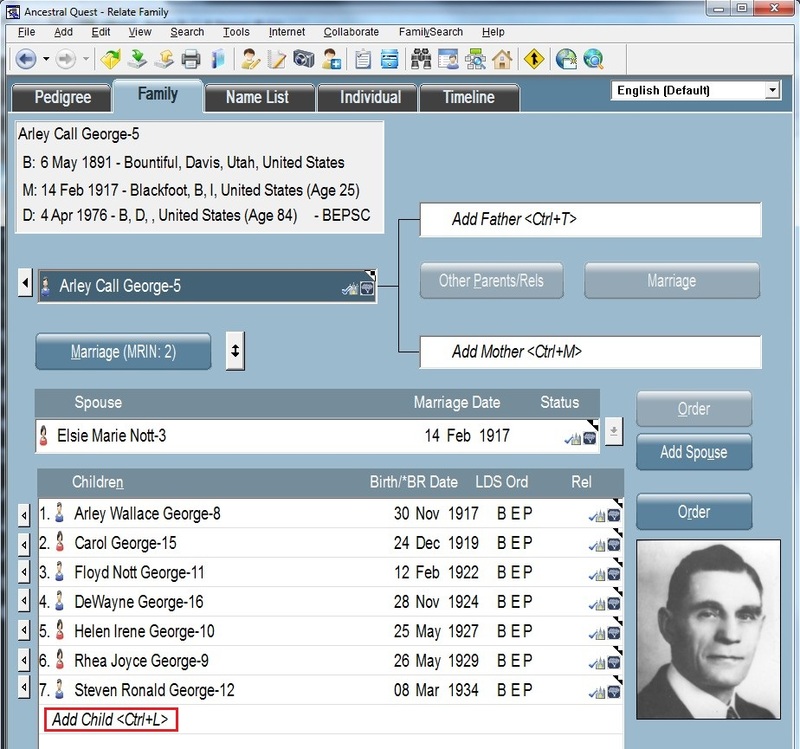 One way to use the GUID is when you create records in your AQ file, and send all or part of them to a relative so that they can help you with your research. The GUID guarantees that you can always identify this record as having been created by you. If your relative returns this record to you after making changes, remember that one of the changes may have been the name of the individual. You may have created the record as Robert Wood, and your relative could return the record to you under the name Richard Woods. You will make a backup of your file then import the GEDCOM which was sent to you. Will you recognize that Richard Woods is Robert Wood? Possibly not. If you were to merge duplicates using GUID, AQ will see the same GUID in both records and know that they were the same person. Here is a link to an article I wrote called GUID. Since the missing GUID refers to a non-existent person (UNKNOWN) it makes little difference. AQ will continue to run correctly. Thank you, Dale. Now I will be able to sleep soundly. I have just found your blog mentioning a Yahoo AQ user group. Following your directions I’ve gone to the User Group page for Eastern US where there is no mention of a Yahoo Group. In reading your post completely, it appears the Yahoo account referred to is one you started. The Ancestral Quest Yahoo group was started by Gaylon Findlay, who owns Incline Software. To get to it, you must have a Yahoo email address. Enter the URL Groups.Yahoo.com in the address line. In the search window that comes up, enter Ancestral Quest and click Search Groups. You should be able to select the group from there. Why will this blog not except my gmail email address?? Your ability to subscribe comes through a widget which I installed into AQ Will Do. I don’t know how the widget works. I have my students subscribe on the first day of class, and several of those use gmail. I have never seen one of them fail to subscribe as intended, so I don’t know how to answer your question. Try again?